Today, I have a review on a product that seems to have very mixed reviews around the blogosphere and the internet in general. I couldn't wait to try it out and see what I really thought about this product. I know that eye creams/gels can cause a bit of suspicion, as many people think is it going to work ? which is completely a natural reaction when you are spending £15.00 plus on trying to sort your under eye problems out. So, recently I have been trying out the Elemis FreshSkin Tired Eyes Gel* out and wanted to let you know what I really think about this product. If you know me and my blog then you might already know that all of my jobs require me spending a huge amount of time on my laptop and this can seriously put a strain on my eyes. I get anything from sore/tired eyes to serious headaches that can last for hours. I have to use the computer for my business and management degree, my business is online, my blog and I also intern for a Jewellery designer which involves a lot of online work *ouch sore eyes*. So, I hope that this review is useful to you lovelies, as I know many of you probably have to spend a lot of time on the computer too! The Elemis Tired Eyes Gel has some nice ingredients such as, Aloe Vera and Butchers Broom. Both key ingredients are good for soothing and reducing inflammation and I believe that Butchers Broom might even help to reduce Dark Circles. The Gel also has Glycerine within it and this helps to hydrate the skin under the eyes, as well as being a great ingredient for people with sensitive eyes. I have found this eye gel to be a real savior for my tired eyes, which I think makes the name of the product very accurate. It's the kind of product that can be used throughout the day to help cool your eyes and ease any soreness. I find gently tapping in around my eye area really revitalizes me and makes me able to carry on with my work at the computer. 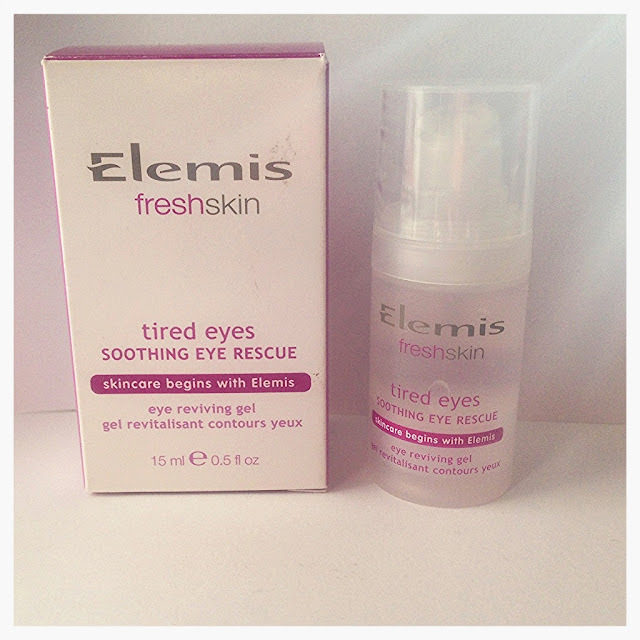 The Elemis Fresh Skin Range is really fantastic, but I do think that £15.00 is quite expensive for this eye-gel, but if you do suffer with tired eyes then it could be worth it. I do feel that it does reduce the feeling of tired, sore and strained eyes, but I do think the price point is just a little high for this product. I also feel that if you are looking for an eye-cream that reduces dark circles then this might not be for you, as its aimed more towards puffy/tired eyes. If you are like me and suffer with tired eyes from computer use and lack of sleep then this actually might be a great product for you. I really like how I can apply it throughout the day and it really does offer me that very much needed revitalization. However, if you want something to help with Dark Circles then this might not be enough for you and the price might be a little high. Overall, from a personal point of view I would re purchase this product again because it does help to keep my eyes feeling fresher for longer. I would love to know what you think about this product, or if there are any eye care products you would like to try? So tempted to buy this, always hesitant with eye products though! Great blog and amazing post. I was navegating and I saw your blog, you have a great blog and style, please come visit my blog and if you like it let me know if you want us to follow each other ok! Hi, I am your new follower who came from bbloggers blog hop! You've got such a lovely blog :) Unfortunately I've never joined bbloggers chat because of time difference (I'm in Tokyo), but I hope to chat with you soon here about beauty! I am your follower now, dear (with gfc & bloglovin`). i've tried a few elemis products and think that most of them are absolutely great but a tad on the pricey side. i hadn't realised that they did this so i might pop out and get it, i could do with it! PS: I'm sure you've gotten this a lot, but you have the cutest Blogger Header!